BOB ABERNETHY, anchor: In the U.S. and Europe, the other best-known Buddhist leader, besides the Dalai Lama, is the renowned Vietnamese Buddhist monk, Thich Nhat Hanh. 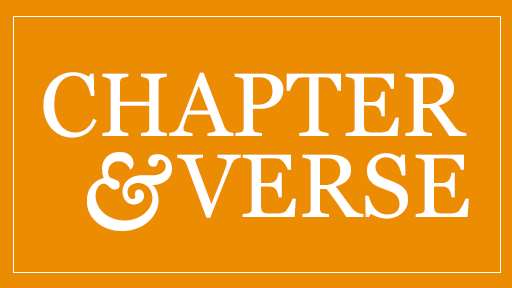 He, too, has been on a U.S. tour, ended this past week — speaking, leading retreats, and promoting his latest of more than 75 books, Creating True Peace. Many people may find Nhat Hanh’s teachings Utopian, but he is convinced they are practical and proven. He has opposed violence for more than 50 years. Martin Luther King, Jr. nominated him for a Nobel Peace Prize. 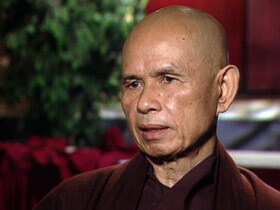 Nhat Hanh insists he is a monk, not a politician. But as he toured the U.S. he spoke not only of Buddhist practices but also — often and critically — of American policies in the Middle East. We caught up with Thich Nhat Hanh during late afternoon rush hour on Capitol Hill, in Washington. Shielding his eyes from the sun, he practiced his customary attentive, so-called mindful walking — to the Library of Congress to talk to Members of Congress, and others, about peace in a world of terrorism. He said since 9-11 the level of hate and violence has gone up. 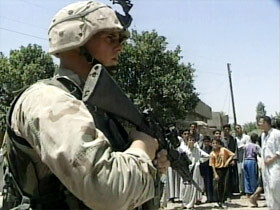 He blamed America’s use of force. ABERNETHY: That’s not a sentiment you hear everyday at the Capitol. 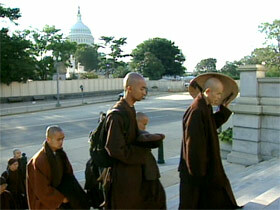 Nor is Nhat Hanh’s recommendation to this bitterly divided Congress that its members practice what he calls deep listening (to each other) and gentle speech. Nhat Hanh became a Zen Buddhist monk when he was 16. His title “Thich” means, symbolically, in Vietnamese, that he is a member of the Buddha’s extended family. 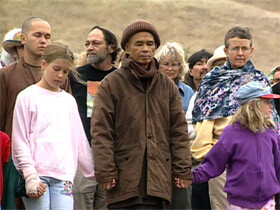 Nhat Hanh’s message emphasizes simple practices. Concentration on every activity — walking, breathing, eating, everything. He says this mindfulness leads to understanding the roots of suffering, which encourages compassion that can dissolve anger. On this year’s U.S. visit, he led private retreats for several members of Congress in Washington, and for police officers in Wisconsin. ABERNETHY: Nhat Hanh thinks violence in America has increased in recent years. He says one reason is too much production and consumption of the wrong kinds of things — movies and television, for instance, that stimulate craving and violence. Thich Nhat Hanh has scheduled a retreat for Israelis and Palestinians next month in France. He has done this before, and he says — for those attending — it always brings reconciliation. Read more of Bob Abernethy's interview with Thich Nhat Hanh.